DirectAccess Consulting Services | Richard M. Hicks Consulting, Inc. I have advocated DirectAccess for the last 3 years at our company. We are mainly a Windows shop running Win7 and Server 2008 R2. Our director (of IT) is old school and doesn’t listen to many new ideas. Any thoughts on how to pull him into the 21st century? If remote DirectAccess clients can connect to on-premises resources, then they should be able to communicate with other connected DirectAccess clients. If that’s not the case, I’d suggest looking closely at the firewall rules on your clients to ensure they are allowing whichever protocols and ports are required. Hi Richard, why direct access clients are unable to communicate with system via IPv4. In my organization, we have a client soluzion (cyber ark outlook plug-in) installed client side and this plug-in contact the cyber ark vault server) calling his IPV4 IP(not use FQDN) so the communication faults. May you please, why the mechanism used by DA client ? 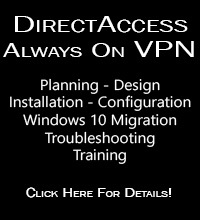 Because DirectAccess is designed to use IPv6 exclusively. The majority of applications work, but some do not. There is no workaround. The application must be able to use host names in order to work over DirectAccess. Hi Richard, I’m looking for some advice on DirectAccess and DPM backup for clients, I thought that DPM could resolve host names. Yet DPM client back up fail for me, do you have any experience in this area? Yes. When the client connects it will attempt to connect to the web probe host URL. You’ll find this information in the output of Get-DAClientExperienceConfiguration under corporate resources. HI Richard, I successfully implemented a 1 server only DirectAccess solution but would now like to make it highly available by adding another server 2012 R2 to the config and utilize the built-in load-balancing. Will there be any downtime (except for when turning off the VM to enable mac address spoofing on the NIC)? I constantly have users connected, working off-site. Does the 2nd server inherit settings from the 1st one when joining the “cluster”? Thanks for your input and great site! You might experience a bit of downtime, but nothing that will seriously impact availability. And yes, when you add the second server to the cluster it will receive all settings from group policy. Just be sure to have the DirectAccess-VPN role and all certificates installed before joining to the array. To help with the DPM question, we were able to successfully enable remote backup to DPM 2010 using the registry and firewall settings discussed in this link. I’ve got DA working perfectly, I have a configuration that uses multisite with three entry points. I now need to decommission one of the entry points. I’ve found the powershell commandlet remove-DAEntryPoint but not much else documentation on how to proceed. Do I simply run the command and delete the GPO? The reason why I’m concerned is because the entry point that I need to remove was the first entry point that was configured. You should be able to do this easily enough using the Remote Access Management console. No need to remove the servers first, just highlight the entry point you want to remove and click Remove Entry Point in the Tasks pane. With DirectAccess, there is no concept of primary/secondary, so removing any entry point, even the first one, should not be an issue. Feel a bit foolish that I didn’t spot that. Thanks for the help and thanks for the really great resource. Thanks again for the response, I removed the entry point and all appeared to be well, until attempt was made to connect a laptop that was using the automatically selected entry point setting. got the following error “multisite settings aren’t available”. Found that my merging the following setting HKLM\SYSTEM\CurrentControlSet\Services\iphlpsvc\DAMultisite from a working laptop managed to re-establish a connection. If however, automatic selection is chosen again, the error returns. I plugged the laptop into the LAN, removed it from the DA group, ran gpupdate, which effectively removed DA. Rebooted and added it back, this did not fix the problem. The best guess is that we need to edit the client GPO to assign one of the entry points as default. I also believe that until this is sorted we are not going to be able to automatically configure any more DA clients. Any Ideas? That’s certainly unusual. I would have to believe that somehow the existing GPOs aren’t being updated if they still contain stale entry point information. I’d verify that the information has been removed properly. Perhaps it’s a replication issue also? Running on Server 2016. I’m still working on a lab setup, running as VMs in a sandbox, and have come across what seems to be a related issue. What I am doing is building a DA server, then I enable multi-site, since doing so after deployment is disruptive to the users. Once multi-site is enabled (still with only one site defined), the client will connect for 20 or 30 seconds, then will completely lose the ip-https tunnel. It is gone, and is not showing in ipconfig. I also lose the multi-site options for DA in control panel. In those first few seconds of up time I exported the registry mentioned herein. Once it fails, replacing the hklm\system\currentcontrolset\services\iphlpsvc\damultisite registry entries with the exported copies brings back the multi-site choice in windows settings. Some jiggling of this site list in settings (specific site, auto, back to specific site), seems to be needed to get it to actually connect though. The only other recovery seems to be to reconnect to the internal net, then disconnect the internal, which fires up the DA connection again. If while those options still show, I change from “automatic” to the one defined site, then it does not fail out. Changing it to “automatic” will again however result in dropping it all in 20 or 30 seconds. Seems like their auto-selection routine may be a bit broken somehow? I’ve never had more than the one site, so there aren’t any remnants of an old entry it could have by accident. I’m doing this on clean lab machines, basically a bare OS load, with no added software, even tested without 3rd party AV, just Server 2016. Each test run while diagnosing, I went back to bare OS and full reinstall. I’d really like to preconfigure the multi-site setting, but at this point it seems like that might not be a viable option. That’s quite unusual. I suspect that something else must be broken. I’ve deployed DirectAccess multisite numerous times without issue using the exact same procedures you describe here. Not sure what’s different in your configuration, but something must be amiss. What that is I don’t know, unfortunately. My organisation is attempting to get DirectAccess up and running, to support a small (initially), and then a large number of potenial clients. This will be run through a complex Gateway environment, and run on 2012R2 Servers, with Win7 clients initially, and later Win10 clients. It should be noted that we are an IPV4 network internally. My question relates to ISATAP. Noting that ISATAP is now unsupported by Microsoft, what would your recommendations be for future-state alternatives for “manage-out” capabilities for DA implementations, in an IPV4 internal network scenario? Enjoy your blog, BTW. Glad you are enjoying the site. 🙂 Yes, Microsoft’s official position on outbound management is to deploy IPv6. Obviously that is the ideal situation. However, deploying IPv6 is not trivial, and there are myriad factors that have to be considered when deploying IPv6 on the intranet. It’s an excellent idea, of course, but often not something an organization wants to do just to enable outbound management for DirectAccess clients. As for ISATAP, although it is expressly unsupported by Microsoft, it is still fully functional and in my opinion a viable alternative to deploying IPv6. When properly deployed it can serve as an effective solution for outbound management, even in scenarios where the DirectAccess servers are configured with an external load balancer or in a multisite deployment. These scenarios require custom ISATAP configuration, but it works well. I have an issue with DA and Citrix XenApp – i can launch xenapp apps from the Web Interface but cannot launch then from a citrix-connector embedded form on an intranet page (i get the ICA file) but it just does not connect to the XenApp server. Telnet 1494 from DA Client shows no connectivity issues….. any ideas?? access resources on it’s Intranet. One of the requirements for a successful Internship is the carrying out of a project and I have decided to do directaccess (hope it doesn’t come back to bite me ). I need help in building a testlab that would represent the firm’s current IT infrastructure. Currently the firm has a Citrix farm in place and a cisco ASA550 as Firewall and NAT. They also run their own PKI. and it only seem to work with just simplified wizard. This is just too basic for me. I think I may have taken on a project too big for me but I intend to see it through. That is why I need some form of guidance or advice. The company won’t allow access to the firewall or Citrix farm. In other words, I am on my own. However, the Project will be implemented based on it’s functionability and how well it is presented. Thanks. Thanks for the reply. I did check the videos and they were quite explanatory. I have began following the procedures with a little twist to my LAB. My challange is How do I introduce a real client computer into a virtual domain? My guess is when I bind the Host(Physical) Server’s network card with a virtual External Network Switch and then attach the client to a physical switch attched to the Host Server’s network card? Assuming your lab has real Internet access, you can use offline domain join as described here. Otherwise you’ll have to come up with some way to connect the physical device to your virtual network. For my labs I have a virtual network interface connected to a physical switch. If I need to connect a real computer I connect it to that switch. As long as you have a single DirectAccess server, just configuring your management workstation to use it as its ISATAP router via group policy is all that’s required. If you have more than one DirectAccess server (load balanced, multisite, or a combination of both), additional configuration is required. Thanks for your generous DirectAccess resources! I’ve had a single-server DirectAccess configuration working well in testing for some months now. We’ve reached a point where we need to create a few exclusions in our DirectAccess configuration, and I may be interested in engaging you depending on how complex you think the answer may be to my question. 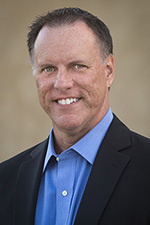 We have recently re-configured our Cisco phone system to be published via Cisco’s Expressway gateway product, so that clients can be connected to voice (SIP), presence, and voicemail services when offsite. It’s working properly for Windows clients NOT using DirectAccess, but for my clients testing DirectAccess it’s (as I expected) not connecting properly. Because the DirectAccess tunnel allows clients to successfully resolve DNS queries for internal resources, the Cisco client software thinks it’s on-network and does not try to contact the gateway to establish connections. All my googling has returned almost no information about how to exclude specific FQDNs from using the DirectAccess tunnel. I see nothing in the server-side GUI, so I assume it may require PowerShell on the server. Can you shed some light, or let me know if I need to contact you privately for a more thorough discussion about how to engage you? If you were having trouble finding information about configuring NRPT exemptions, perhaps that’s a good idea for a blog post. 🙂 It’s easy enough to configure. Reach out to me directly via email and I’ll provide some guidance. FYI, it can be done in the GUI if you prefer that over PowerShell. Hi, Been using your blog ever since implementing DA last year. Find it very difficult to get any support for it though. I have one issue at the moment. Some machines I have using DirectAccess often use the sleep power option. Ive found that when users connect again after coming out of sleep mode DNS can fail. Its only when I flush DNS that it will resolve this? Also, for example if a user still has Lotus Notes client open when coming out of sleep it will not be able to ping the Notes server until we flush DNS. Any suggestions on this? How to update this settings with new AD controllers? Will we have any problems if we demote our old AD controllers? I tried to find any info in Internet but without any success. First of all thanks for so much of valuable information around DA. We are trying to setup a DA with high availability in Azure and as per your article we can use 3rd party LB for NLB. Can you please let me know what 3rd party LB is available in Azure as per your article. I can’t locate one. All of the popular load balancers such as F5, Citrix NetScaler, and KEMP LoadMaster are available in Azure. You can find them in the Azure marketplace. You’ll need to use the new management portal to find them, however. The DirectAccess Network Location Server (NLS) can be located anywhere on your internal network. However, if you are enabling load balancing for DirectAccess, the DirectAccess servers themselves must be on the same subnet. We are having the same issue as Matt above and we have tried your recommendation – disable negative DNS caching but it did not fix our issue. We have the same issue as Matt but flushing the DNS does not fix the issue. Users have to reboot in order to appear as inside the network. Running the diagnostics shows clients as outside the network, all DA servers are available if you ping the IP address and if you use NSLOOKUP it resolves the names but not thru ping. Any other suggestions to troubleshoot? I’ve setup a new 2016 Server with DirectAccess as Edge deployment with IPv4/IPv6 Internet and IPv4/IPv6 Intranet. When the clients are connecting via IPv4 (6to4, teredo, IPHTTPS) everything is working fine. But when clients are connecting by native IPv6 and try to use IPv4-only ressources, the connection might fail. I tracked this down to MTU issues and misleaded ICMPv6 “Paket too Big” messages, but I currently have no idea how to fix this. When a client now tries to connect to a IPv4 ressource, the communication will work as long as the pakets are not getting too big. If so, the DA server drops the paket and generates a ICMPv6 PTB messages. This should notify the sender of the too big paket about the maximum MTU to use. The Problem is: the DA server sends the paket through the wrong interface. PTB Message does exit the external interface as ICMPv6 with a destination IP FDC6:55FD:D741:7777::/96 where it should be converted by NAT64 to an ICMPv4 message and sent through the internal interface to an IPv4 destination address. “ping -6 fdc6:55fd:d741:7777::a60:430a” for example does not work from the DA Server, while “ping -6 fdc6:55fd:d741:7777::a60:430a -S 2001:DB8:C1:DB::DA” does work on the DA Server. It looks like some strange source selection/routing issue but I dont get the clue. Do you have any idea in which direction I should research further? Unfortunately, there are a number of issues with DirectAccess that arise when you have IPv6 deployed natively. I’m aware of potential routing issues, specifically when a DirectAccess client connects with an IPv6 address and doesn’t use a transition technology. The only way I’m aware of to resolve this issue now is to configure the DirectAccess server as the internal network’s default gateway. Obviously that’s less than ideal. There may be a better way to address this, but I’m not aware of one at the moment. As for MTU issues, that’s odd as well. DirectAccess deployments with native IPv6 are quite uncommon in my experience so I don’t have a lot to offer in terms of advice. You may want to open a support case with Microsoft on this though because it sounds like a possible bug. Unfortunatly we need to use native IPv6 as some ISPs of our users are using DS-Lite. Some of those DS-Lite can’t reach the DA Server 6to4 IPv6 DTE for some reasons, others have problems with carrier-grade NAT and IP-HTTPS. So just disabling IPv6 on client LAN/WiFi adapter won’t help. I’ll deal with the routing issues later (got an idea how this could work) as currently we don’t have any native IPv6 hosts the users will need to use by DA. I’ve already opened a case with MS but as we don’t have a premier contract yet (working on it) they refused to analyze the cause and suggested to permanently lower MTU für IPv6 on client side. This has been rejected by my supervisors for several reason so MS is currently no real help. I suspect some changes to the network stack with server 2016 so maybe they introduced a new bug with 2016. I’ll “downgrade” my lab to 2012 R2 for testing purposes. Anyway, I’ve read your book “Implementing DirectAccess with Server 2016” and got a correction and some comments regarding native IPv6 you might find interesting. The IPv6 addendum in my DirectAccess book is based on my somewhat limited experience with DirectAccess and native IPv6 deployments. I wanted to include something on the topic, however. I’ve since had more exposure to this scenario and I admit that I learn something new every time. I look forward to hearing your feedback too. Hi Richard, quick question: we have the DA implementation running quite well over a Netscaler. Everything is stable. The only thing we have noticed is, if a client goes quick in standby or the connection is disrupted for a shorttime and comes back the DA tunnel won´t be restored Client OS is Win10 (1511) is telling “Action needed” and says “turn on Windows firewall” although it shows the firewall is turned on. Only a reboot of the client does resolve the issue. Normal behaivour (regarding token) or bug? Couldn´t find an answer in your really great book. Interesting that you got a firewall not enabled message though. Regardless, glad you were able to get it resolved! Hi Ben. Have to assume that is a bug. Very unusual for sure. I am working at a small company of 6 people. We have a customer, he has 10sites in different cities. The first two sites has win 10 clients. The other sites has win 8 home edition and they do not want to pay for upgrade. At the moment we use teamviewer to give support to the 10 sites . Is it possible to use Direct Access to give them support. Usually permission issues or installing new printer and share it , creating new shared folders. Note: I need my supporting team to work remotely. That would depend entirely on how you provide support. If you plan to use DirectAccess yourself to access their network, it probably won’t provide much value over and above what TeamViewer is providing. However, if you want the customer’s machines to be better managed by having consistent connectivity to the corporate network, then DirectAccess will provide some value to you. I am planning to use direct access to access their network (servers and Pcs). Colud you please advice me what to use for accessing their network and keep giving them support? It depends on a lot of things, but using a client-based VPN is probably the easiest way to accomplish what you want. Most firewalls support VPN, or you could easily stand up a Windows server and install RRAS. I just don’t recommend installing RRAS/VPN on the DirectAccess server if you deploy one. I recently submitted a question to you via a different web form, when what was looking for all along was this page, which I finally found again today. So please pardon if this is a duplicate question for you. We run a single-server DirectAccess solution, thanks to your blog and your generosity of a quick phone call with me, quite a few months ago. It’s working well, hosted on Server 2012 R2. Most DA clients are Windows 8.1 with a couple running Windows 10 Enterprise. So they should all be using IP-HTTPS with null encryption. I recall from our implementation that if I were to install the RRAS role on this server to terminate client VPN connections, support for the null cipher suite would be removed and DirectAccess performance would suffer. Fortunately, I don’t need my DA server to terminate VPN connections – we have another VPN solution to fall back on when needed. However, I DO need to set up a RADIUS server. I’d like to begin using RADIUS for our corporate Wi-Fi, but I’d prefer not to spin up a totally new server to do this, so I’m considering adding the Network Policy Server role to my DirectAccess box. My DirectAccess server is located within our data center, and my access points are obviously located within my three branch offices. This means the Network Policy Server authenticating wireless clients would not be on the same broadcast domain as all the Wi-Fi APs; some RADIUS authentication requests would have be routed across a direct WAN link, others routed through a site-to-site VPN tunnel between two ASAs, to reach the RADIUS server. Is there anything about my DirectAccess configuration that would be affected if I were to add the NPS role to the DirectAccess server? I don’t believe that installing the NPS role on the DirectAccess server would have any adverse affects. However, this is not something I have tested. Generally speaking it is not recommended to install other roles on the DirectAccess server, but for small implementations it might be unavoidable. Let me know how it goes! First, thank you for all you do here. Your information has helped me get over a few hurdles in the past. My question is regarding accurately tracking DA users who use shared computers in a configuration which includes a forward proxy using cached credentials. We do not have the resources available to authenticate every HTTP request from a browser against AD. The problem arises wherein a user logs off of a shared machine and another logs in. Due to the DA server only serving addresses from 2 NICs (as opposed to an assigned IP pool) we will sometimes see the previous user’s AD credentials authenticating for web traffic until the timeout is reached on the proxy cache. This problem makes our ability to identify user traffic questionable, and may result in legal issues for us in a scenario in which disciplinary action is taken against a user for their browsing activity (we can’t absolutely be sure someone else didn’t log on to the same machine which was still using their cached credentials and then do naughty things). Is there any way around this? As I said, we don’t currently have the capability of authenticating all traffic line-by-line, and have to rely on the proxy caching credentials. What alternative solutions are available if this is not supported by Microsoft? Can Azure VPN Gateway be an alternative Solution? Hi Aziz. So yes, DirectAccess is not formally supported in Azure. It does work though and I have a number of customers who are running DirectAccess in Azure and also in AWS. If you are willing to forego the supportability, it can be an excellent solution. Azure does provide supported remote access alternatives though. The Azure VPN gateway supports site-to-site (client-based) VPN which might address your remote access needs. my question is, how to create an external address( external IP) on the new virtual server .in LAN .without going through a NAT? the Forefront UAG SP1 DirectAccess server has two consecutive IPV4 external address, it must absolutely remain active during the migration (computers will migrate little by little) .the servers will be removed at the end of the migration. 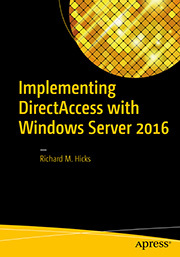 The Direct Access 2012 R2 server must respond to one or more external IPV6 addresses. I think you can safely put 300 DirectAccess clients, even if all of them are Windows 7, on one DirectAccess server without too much of a performance hit. Where Windows 7 clients really cause problems are when you get to that 1000-1500 per server range. That’s where you really start to see resource utilization issues. Personally, I would implement your new parallel DirectAccess deployment behind a NAT and migrate your clients over in phases. You can monitor resource utilization on your server as you migrate and if it turns out to be an issue, simply add more resources (more CPUs/memory or additional servers).